The CD55 antigen is a single chain glycosyl-phosphatidyl-inositol (GPI)-anchored, cell surface protein. This molecule undergoes post-transcriptional and post-translational modification resulting in a heterogeneous molecular weight ranging from 55 to 80 kDa. The CD55 antigen, also named Decay Accelerating Factor (DAF) is involved in the regulation of both alternative and classical complement pathways. C3b/C3Bb and C4b/C4b2a convertases, as well as echovirus, coxsackie B virus and CD97 are reported to interact with CD55. Like other GPI-anchored proteins, CD55 is associated in the cytoplasmic compartment with tyrosine kinases allowing signal transduction. 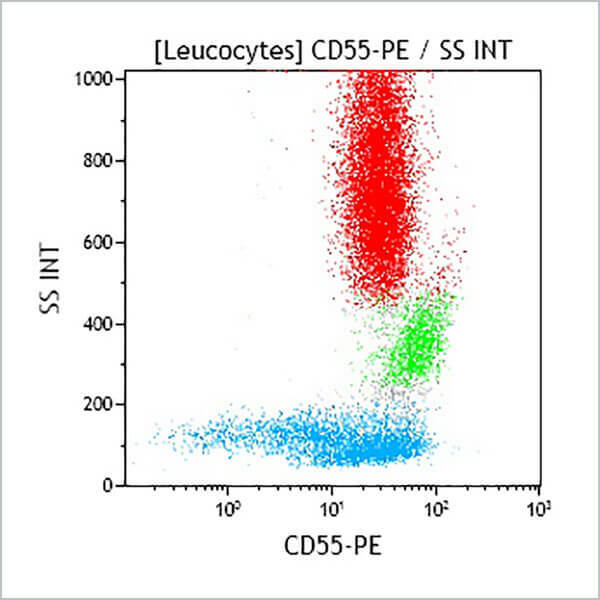 The CD55 molecule is widely expressed on human cells including leucocytes, erythrocytes and platelets. CD55 is weakly expressed on NK cells.